"The Botanical Garden is a green oasis in the city of Oslo – a place to get inspiration and experience beauty. Its main mission is to keep documented collections for research and teaching, to increase the knowledge and understanding of plant diversity, the basis of life on earth, and to contribute to the conservation of threatened plants. 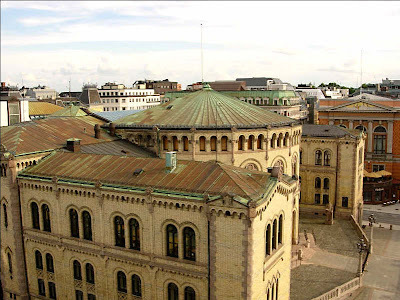 The Botanical Garden of the Natural History Museum plays an important role in the research and teaching of systematic botany at the University of Oslo. 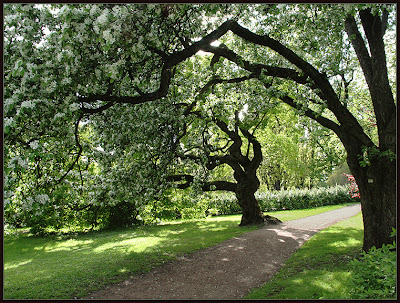 In addition, primary schools and high schools, particularly in the Oslo region, make good use of the Botanical Garden's resources for teaching. Together with outreach specialists at the Museum, the Botanical Garden offers its own educational program." The Botanical Garden is a really beautiful place! 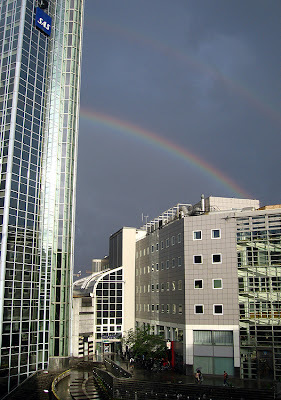 Its been raining a lot in Oslo this summer, but occasionally the sun comes out and shine for a little while. And dark clouds, rain and sun all together at the same time often make a wonderful and very special light, and like in this picture; rainbows! The same Opera House as yesterday, but another view. 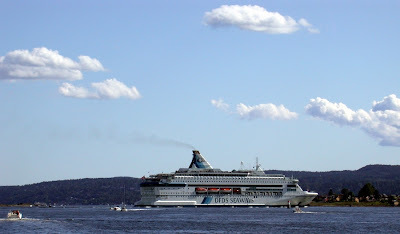 This is actually the view from the top of the DFDS-ship, while leaving Oslo heading towards København, one week ago. 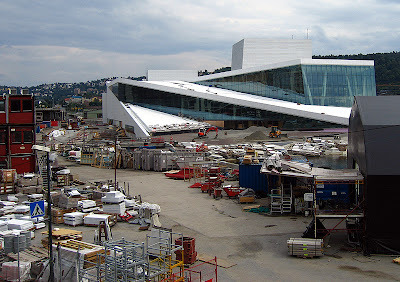 This is the new Opera House in Oslo. As you can see, it's still under construction. The base area of the Opera House is the same as the total area covered by four international standard football fields. The building has 1100 rooms grouped in a number of sections, such as public area, stage area and production section. The official opening will be in april 2008. 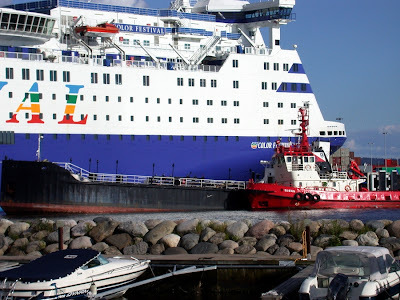 This is another one of the big ships that arrive in Oslo everyday. I have some vague memories of being very drunk onboard of one of these. 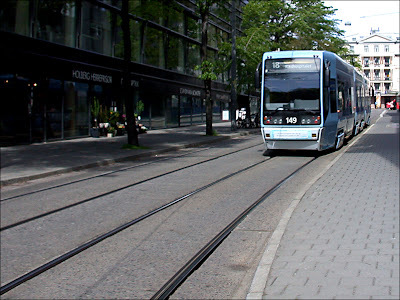 Not my proudest moment, but I guess most young adults in Oslo share that experience. These ships go to Denmark (and some to Germany) and all sell inexpencive alcohol and tobacco onboard in their taxfree-shops. These things are very expencive in Norway, so people go on these trips to buy the "bad stuff". Well, they also go to have fun and on holidays. 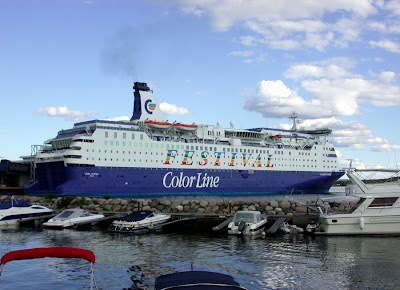 This is the Color Line Festival arriving at the terminal, the place I showed you in my last post. 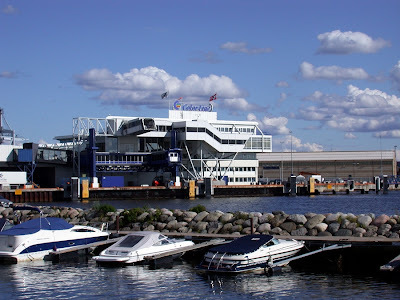 This is where the huge boats from Color Line arrives and leaves, bringing passengers and cars to ports in Denmark and Germany. Photo was taken on the same day and spot as the thieving seagull. 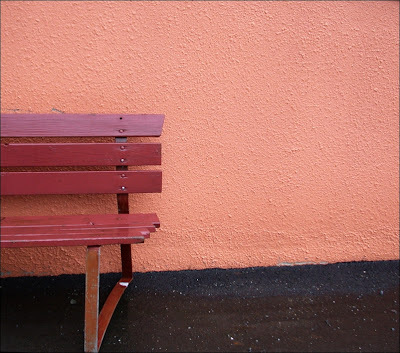 The bench from yesterday is from the same place as this photo. 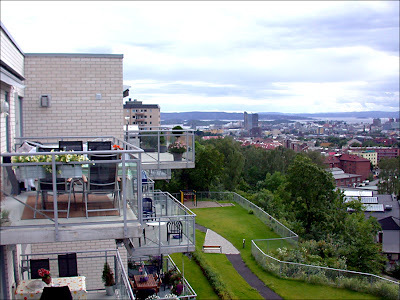 I think these people living on the top of Carl Berner (an area in Oslo, quite near the center) are really lucky. They have a fantastic view, don't you think? When the weather is nice they can sit outside, enjoying the view while they have a good meal with their family and friends. 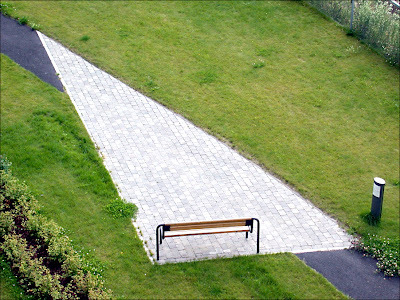 This bench, surrounded by green grass and bushes, offers a nice view if you sit yourself down for a while. I spent a great afternoon and evening down by the seaside at Frognerstranda, a place where you have a great view of the inner parts of the Oslo fjord. Huge ships came and went, people enjoyed a sunny day out on their boats, and I spent a few hours drinking ice cold beer with some nice people. This seagull seemed to know this place well. He sat on a roof nearby, closely watching when people was served, not going to miss any chance to get a good meal. 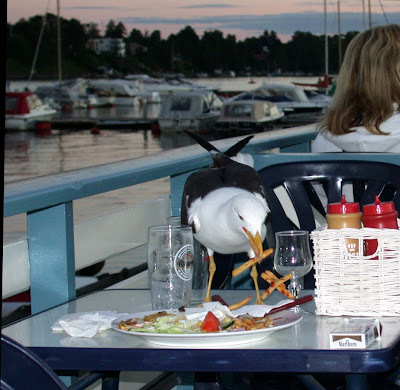 First, he almost stole some man's dinner. We managed to scare the big bird away, but he didn't give up. Later he found two plates with leftovers and had a fiest! No rain for two days. Whohoo! 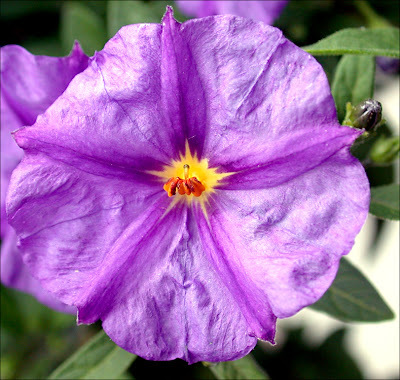 Well, to celebrate: here's a flower for you. Finally a sunny day! 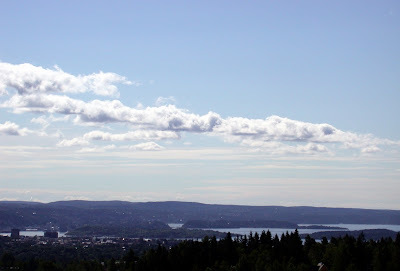 This is my view of the inner parts of the Oslo fjord, taken this morning. 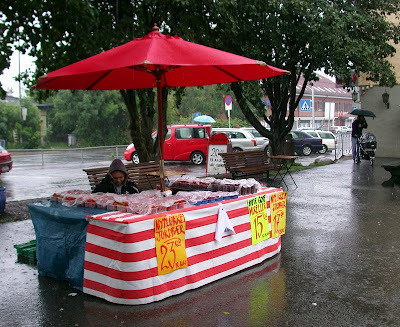 This young woman is selling berries, strawberries, raspberries and cherries. Not many around to buy any at the time I took this photo. It was pouring down! I bought some berries and they were delicious! This is not far from Rådhusplassen and Aker Brygge. It's the musem of all winners of the Nobel Peace Prize. It's the old railway station Vestbanen. Which were station for all trains to west of Norway. 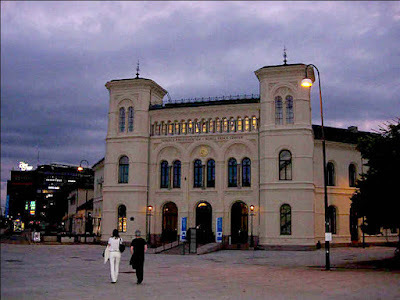 It's build in 1872 of Georg Andreas Bull (only in norwegian) and were closed in 1989 when the main railway station opened. Soon it'll be built new buildings behind it and it won't be teared down. My sister is back tomorrow with new photos. Thanks for all comments! This is taken in the evening near Aker Brygge, at Rådhusplassen. It's Steve Bloom's exhibition in Oslo. 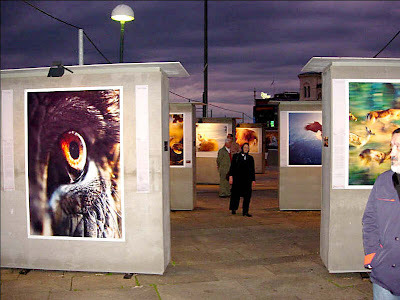 Many pretty pictures of wild animals! This is the watch with the Freia at. 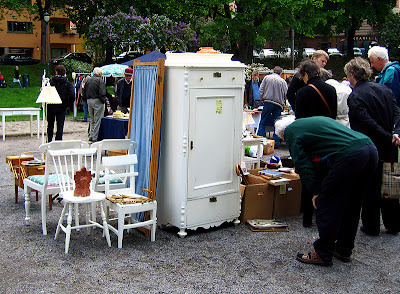 It's at Egertorget in downtown of Oslo. My sister Lothiane can see it from her balcony. This is taken from the top of Grand hotel. Great view! 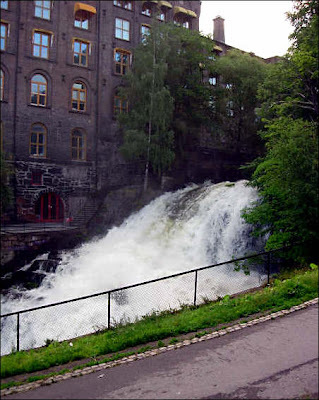 This is one of the waterfall in Akerselva. Just above the brigde Sannerbrua. 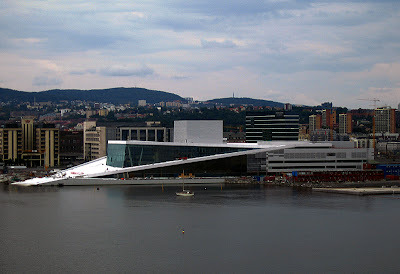 It's one of the main-rivers of Oslo and an important for the manufacturing industries. 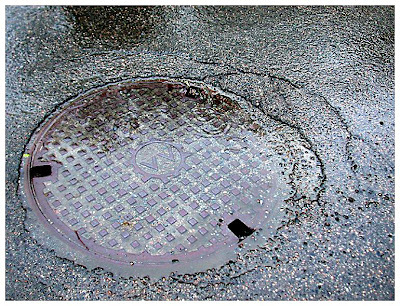 It's also the classical border between the west and east of Oslo. The west-side were the best and rich, while the east were the workers land. And it's also a different dialect between west and east. West have the high-class, while the east are where people talked slang and low-class. Last days the Akerselva have been big, because of much rain. So it's much bigger than on the picture! In the wintertime, the waterfall is under ice, and it's beautiful. I see the waterfall everyday when I travel to my work. This is taken from the top of Grand hotel. 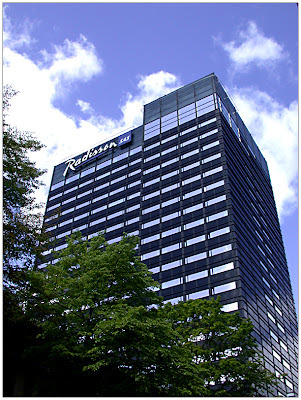 The first one is the main building and other buildings connected to the main one. The second is with some of the park, which you saw here. Just now it's summervacation there, so nothing is happening there right now. But it's guide that show the parliament from the inside during the summer. 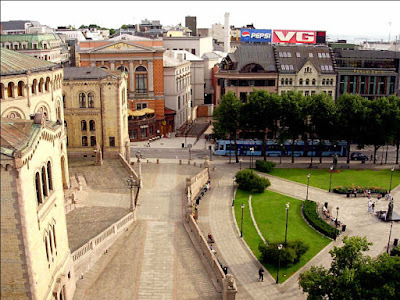 This is a park in the front of the Norwegian Parliament in Oslo, which you see in the background of the picture. 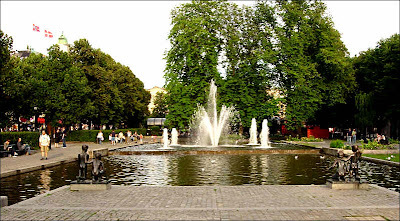 It's a beautiful park between the Karl Johans gate and Stortingsgata. In the summer people use this for resting and enjoying watching the life at the streets. 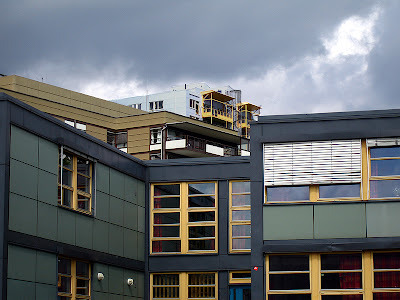 In 1956 it were build by the Christiania Spigerverk (which make nail/spikes) and it got called Spikersuppa (The Spike soup) by the people. Arne Durban made the statues of the children. 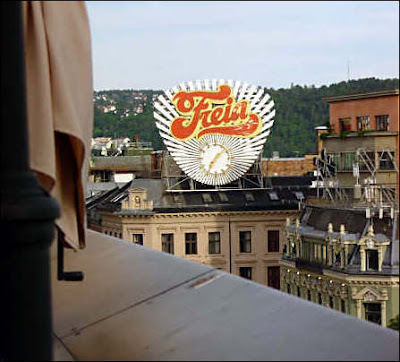 The flags you see at the left side is from the hotel Grand, which is one of the most dashing hotels of Oslo. The winners of Nobel peace Price use to stand at the balcony of Grand. 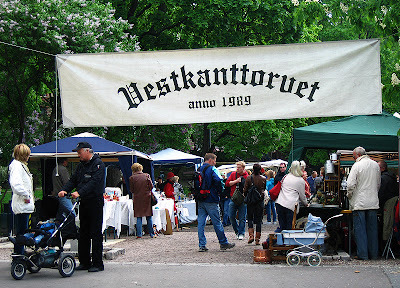 Here are some more photos from Vestkanttorvet market that I told you about yesterday. Tomorrow morning I'm leaving on a holiday, so my sister "Imzadi" has kindly offered to take my place while I'm gone. 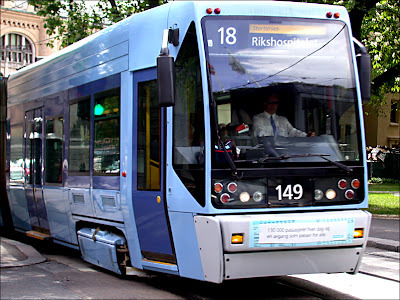 I'm going to Stavanger *waves to tanty* and hopefully will have some nice days together with my family there. 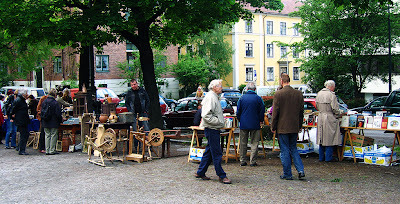 Oslo's oldest market is a popular and traditional bric-a-brac/antiques market close to the Vigeland park, on the corner of Prof. Dahls gate/Neuberggata. Furniture, china, glass, kitchenware, paintings, silver, jewellery, clothes, glass and all kinds of collector's items. 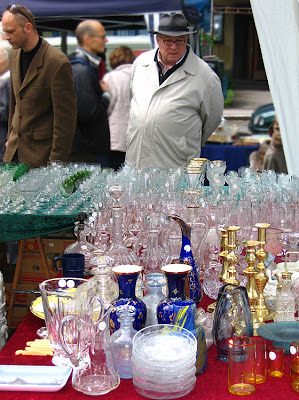 The market is open Saturdays all year. This is Oslo too... From Sørkedalen, a valley Northwest in Oslo. This is a lovely area where you find the Bogstad Estate and lots of nice places to go hiking or skiing. I am back from Scotland where I had a great time! Too bad I can't submit photos from my trip here, but I'm adding an album online soon and will share the link for those who're interested. The weather in Oslo is awful these days. It's raining and the temperature is quite low. I do hope we'll have some more summer soon! 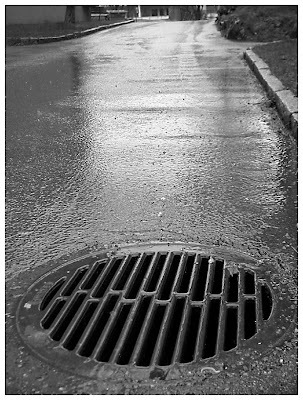 This is a photo from another rainy day. 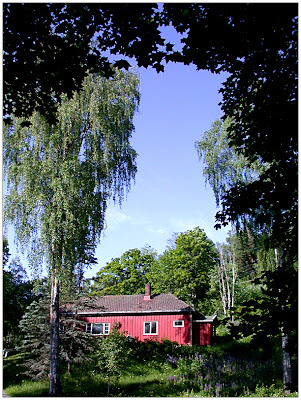 This is from the Bogstad Estate that I showed you earlier. 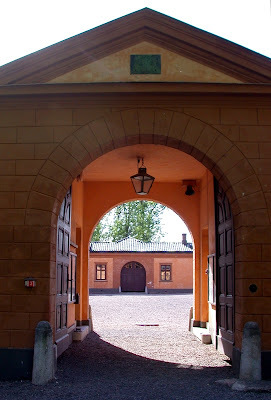 This is the gateway into an atrium with the estate building(s) around it. Very nice. On the right side there's a café and the estate is a museum where you can enter and see the different rooms. I haven't been in there, but I'm sure I'll do that one day. 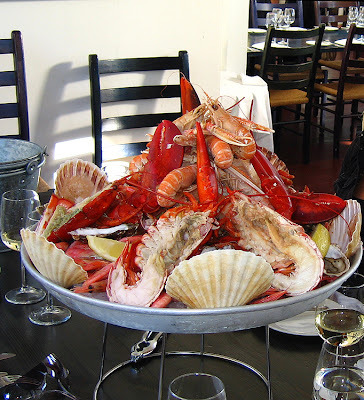 This is Oslo's theme photo for July 1st: Delicious sea food from an Oslo restaurant.